Tonight there was a late feed. It lasted at least 20 minutes during which time the female made sure that all the chicks got their fair share. 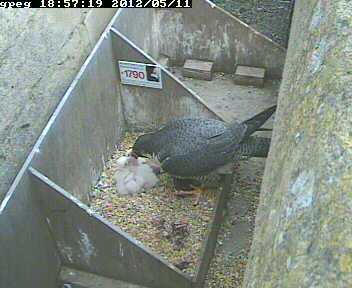 Falcons tear their prey and this enables each chick to be fed lots of very tiny portions. 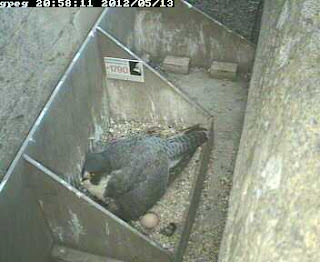 She is now concentrating on brooding the three chicks and is no longer attempting to incubate the remaining egg which is no longer viable. When we ring the chicks in about two weeks time we shall collect the egg for analysis by experts.